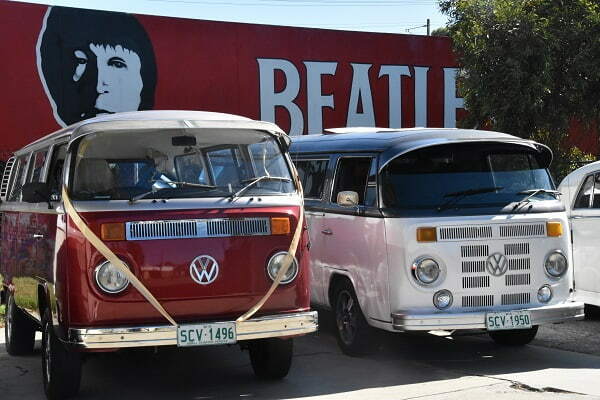 Do you want to add style when you hire a kombi? Do you want something more impressive than the usual? Then why settle for an ordinary hippy van and instead get something like kombi limousines? Stretch kombis are an excellent way to go out in style. They have the same overall design as a more traditional Kombi but also integrate features you see in luxury limousines. The result is something that brings back the funk of the past and the modern comforts of a stretch limo. Our Kombi limousines come decorated in either a vintage cream colour or a more elegant white. Either colour is ideal for a wedding, but also eye-catching and just plain cool. Hire a kombi from us and get the best. Our Kombi limousines come with a broad range of features. Here’s some of what you can expect. Our stretch kombis have seating room for up to ten people in the rear, but still provide leg and head room. You won’t feel cramped or like sardines with us. Air conditioning comes standard, which is a plus for some of the hotter parts of the area. This add-onisalso a comfort feature that you don’t often see on vintage vehicles like a standard kombi. When you hire a kombi from us, the windows aren’t tinted. You’ll have a clear view to the view outside. Kombi limousines are an excellent choice for weddings, parties, and other events. Combine the happy feeling of the past with the greater modern comforts of a stretch vehicle. Our cars are impressive and guaranteed to make good memories.